We developed a new endogenous approach to reveal subcellular metabolic contrast in fresh ex vivo tissues taking advantage of the time dependence of the full field optical coherence tomography interferometric signals. This method reveals signals linked with local activity of the endogenous scattering elements which can reveal cells where other OCT-based techniques fail or need exogenous contrast agents. We benefit from the micrometric transverse resolution of full field OCT to image intracellular features. We used this time dependence to identify different dynamics at the millisecond scale on a wide range of organs in normal or pathological conditions. B. Alberts, A. Johnson, J. Lewis, D. Morgan, M. Raff, K. Roberts, and P. Walter, Molecular Biology of the Cell, 6th ed. (Garland Science, 2014). M. Guo, A. J. Ehrlicher, M. H. Jensen, M. Renz, J. R. Moore, R. D. Goldman, J. Lippincott-Schwartz, F. C. Mackintosh, and D. A. Weitz, “Probing the stochastic, motor-driven properties of the cytoplasm using force spectrum microscopy,” Cell 158(4), 822–832 (2014). E. L. Elson and D. Magde, “Fluorescence correlation spectroscopy. I. Conceptual basis and theory,” Biopolymers 13(1), 1–27 (1974). H. Chen, E. R. Farkas, and W. W. Webb, “Chapter 1: In vivo applications of fluorescence correlation spectroscopy,” Methods Cell Biol. 89, 3–35 (2008). N. T. Shaked, M. T. Rinehart, and A. Wax, “Quantitative phase microscopy of biological cell dynamics by wide-field digital interferometry,” in Coherent Light Microscopy (Springer, 2011), pp. 169–198. G. Popescu, Y. Park, W. Choi, R. R. Dasari, M. S. Feld, and K. Badizadegan, “Imaging red blood cell dynamics by quantitative phase microscopy,” Blood Cells Mol. Dis. 41(1), 10–16 (2008). J. Lee, W. Wu, J. Y. Jiang, B. Zhu, and D. A. Boas, “Dynamic light scattering optical coherence tomography,” Opt. Express 20(20), 22262–22277 (2012). W. Drexler and J. G. Fujimoto, Optical Coherence Tomography: Technology and Applications (Springer Science & Business Media, 2008). W. Tan, A. L. Oldenburg, J. J. Norman, T. A. Desai, and S. A. Boppart, “Optical coherence tomography of cell dynamics in three-dimensional tissue models,” Opt. Express 14(16), 7159–7171 (2006). K. Jeong, J. J. Turek, and D. D. Nolte, “Volumetric motility-contrast imaging of tissue response to cytoskeletal anti-cancer drugs,” Opt. Express 15(21), 14057–14064 (2007). N. N. Boustany, S. A. Boppart, and V. Backman, “Microscopic Imaging and Spectroscopy with Scattered Light,” Annu. Rev. Biomed. Eng. 12(1), 285–314 (2010). A. Dubois, L. Vabre, A.-C. Boccara, and E. Beaurepaire, “High-Resolution Full-Field Optical Coherence Tomography with a Linnik Microscope,” Appl. Opt. 41(4), 805–812 (2002). O. Assayag, M. Antoine, B. Sigal-Zafrani, M. Riben, F. Harms, A. Burcheri, K. Grieve, E. Dalimier, B. Le Conte de Poly, and C. Boccara, “Large field, high resolution full-field optical coherence tomography: a pre-clinical study of human breast tissue and cancer assessment,” Technol. Cancer Res. Treat. 13(5), 455–468 (2014). O. Assayag, K. Grieve, B. Devaux, F. Harms, J. Pallud, F. Chretien, C. Boccara, and P. Varlet, “Imaging of non-tumorous and tumorous human brain tissues with full-field optical coherence tomography,” Neuroimage Clin. 2, 549–557 (2013). A. L. Oldenburg, V. Crecea, S. A. Rinne, and S. A. Boppart, “Phase-resolved magnetomotive OCT for imaging nanomolar concentrations of magnetic nanoparticles in tissues,” Opt. Express 16(15), 11525–11539 (2008). A. L. Oldenburg, R. K. Chhetri, J. M. Cooper, W.-C. Wu, M. A. Troester, and J. B. Tracy, “Motility-, autocorrelation-, and polarization-sensitive optical coherence tomography discriminates cells and gold nanorods within 3D tissue cultures,” Opt. Lett. 38(15), 2923–2926 (2013). A. L. Oldenburg, X. Yu, T. Gilliss, O. Alabi, R. M. Taylor, and M. A. Troester, “Inverse-power-law behavior of cellular motility reveals stromal–epithelial cell interactions in 3D co-culture by OCT fluctuation spectroscopy,” Optica 2(10), 877–885 (2015). 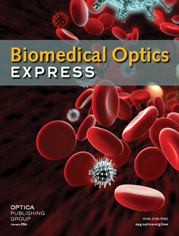 G. Farhat, A. Mariampillai, V. X. Yang, G. J. Czarnota, and M. C. Kolios, “Detecting apoptosis using dynamic light scattering with optical coherence tomography,” J. Biomed. Opt. 16(7), 070505 (2011). R. M. Pasternack, J.-Y. Zheng, and N. N. Boustany, “Detection of mitochondrial fission with orientation-dependent optical Fourier filters,” Cytometry A 79(2), 137–148 (2011). C.-E. Leroux, J. Palmier, A. C. Boccara, G. Cappello, and S. Monnier, “Elastography of multicellular aggregates submitted to osmo-mechanical stress,” New J. Phys. 17(7), 073035 (2015). G. Popescu, Y. Park, R. R. Dasari, K. Badizadegan, and M. S. Feld, “Coherence properties of red blood cell membrane motions,” Phys. Rev. E Stat. Nonlin. Soft Matter Phys. 76(3), 031902 (2007). R. M. Viguera, J. Rojas-Castañeda, R. Hernández, G. Reyes, and C. Alvarez, “Histological characteristics of the intestinal mucosa of the rat during the first year of life,” Lab. Anim. 33(4), 393–400 (1999). M. Chanrion, I. Kuperstein, C. Barrière, F. El Marjou, D. Cohen, D. Vignjevic, L. Stimmer, P. Paul-Gilloteaux, I. Bièche, S. R. Tavares, G. F. Boccia, W. Cacheux, D. Meseure, S. Fre, L. Martignetti, P. Legoix-Né, E. Girard, L. Fetler, E. Barillot, D. Louvard, A. Zinovyev, and S. Robine, “Concomitant Notch activation and p53 deletion trigger epithelial-to-mesenchymal transition and metastasis in mouse gut,” Nat. Commun. 5, 5005 (2014). R. E. Mebius and G. Kraal, “Structure and function of the spleen,” Nat. Rev. Immunol. 5(8), 606–616 (2005). C. Demené, T. Deffieux, M. Pernot, B.-F. Osmanski, V. Biran, J.-L. Gennisson, L.-A. Sieu, A. Bergel, S. Franqui, J.-M. Correas, I. Cohen, O. Baud, and M. Tanter, “Spatiotemporal Clutter Filtering of Ultrafast Ultrasound Data Highly Increases Doppler and fUltrasound Sensitivity,” IEEE Trans. Med. Imaging 34(11), 2271–2285 (2015). Le Conte de Poly, B. Fig. 1 (A) An FFOCT setup and illustration of the effect of a vertical movement of a single scatterer inside a voxel in terms of intensity variation on the camera. (B) is a sequence of direct images on the camera with removed mean intensity, that gives after processing the image below. (C) to (F) are time signals of four pixels of the same image of intestine (cancerous mouse, see the full field in Fig. 5). (C) presents a visible high dynamic, whereas (D), (E) and (F) give different D-FFOCT signals but are not distinguishable to the eye. We can notice that the signal level is very close to the noise level, giving low SNR D-FFOCT images, this is due to several reasons, including thermal noise (Brownian motion), mechanical noise (instabilities of the experiment) and the weak scattering signal coming from moving scatterers. Fig. 2 (A) FFOCT of mouse brain cortex, (B) D-FFOCT image of the same region and (C) composite image shows superposition of the somas with OCT dark spots and axons bundles. Field of view 350x320µm. (D) is a FFOCT image of a rat liver with (E) a zoom on the green box. (F) and (G) show the corresponding zones of the D-FFOCT image. (H) is a zoom focused on one specific cell, we can observe different clusters of scatterers inside. This image is located on the surface of the rat liver with part of the capsule (highly reflective in D) remaining in the lower part of the field. We can note that the D-FFOCT signal is weaker in those areas corresponding to where the capsule is thicker. (D) and (F) are 800x800µm, (E) and (G) are 325x250µm and (H) is 65x65µm. (I) is a 3D D-FFOCT image of rat liver 170x170x51µm3. Cells can be reconstructed along the z dimension and conserve a continuity in dynamic contrast. This means that the source of the contrast is moving in a confined volume and that no cell migration is occurring during the acquisition. (J) corresponds to I in cross-section where cells are recognized without artefacts (image dimensions are 123x43µm2). (K) is a 3D view of kidney 604x604x42µm3 where tubules are visible over the whole field, orientated from the lower left corner to the upper right one. We can also identify a lot of small objects that are yet to be identified. Fig. 3 Graph shows a decrease of the overall D-FFOCT contrast, the sample (rat liver) was imaged once an hour for 27 hours until it reached the noise level (typical signal level of the background tissue outside the cells = 0.25). (A) D-FFOCT image of rat liver. An incision was made in the tissue to introduce the inhibitor (arrow). (B) is the same field of view after introducing the glycolysis inhibitor (2-deoxy-D-glucose). The inflammation has narrowed the incision and we see a clear drop in signal value (image B is multiplied by ten). Fig. 4 In this graph of the autocorrelation function of 5 different cell types in liver, brain and intestinal tissues. The dynamics of these cells are fundamentally different. We have the erythrocyte cell (in red) with the same signal energy (autocorrelation at the origin is the integral of the squared signal which is the energy) as the hepatocyte (orange) but with rapid fluctuations, while the hepatocyte decorrelates over a longer period. The neuron (green) takes even longer to decorrelate and has a lower energy. In cancerous regions of the mouse intestine, two cell types were identified: one with standard energy and long decorrelation times (blue) corresponding to cancer cells, and the other corresponding to immune cells (black), the highest D-FFOCT signal recorded, which also have long decorrelation times, but with a different damping factor. The noise signal has been removed from these curves using: AC F noisefree = AC F signal 2 −AC F noise 2 . Images (A-F) illustrate the discriminating power of multi-scale D-FFOCT analysis. (A) FFOCT image of rat liver, where the dark areas are capillaries and hepatocytes appear uniformly grey. (B) is the same field in D-FFOCT, where hepatocytes and erythrocytes are visible and there are inhomogeneities in the cytoplasm of hepatocytes. (C) and (D) are filtered data for respectively short and long time scales. (E) is the overlay of (C) and (D) in red and green respectively. (F) is a zoom of the same field of (B) and (E). Fig. 5 (A) is a FFOCT image of a mouse intestine in normal condition, (B) is the same 800x800µm2 field in D-FFOCT while (C) is the combination of (A) and (B) respectively in gray and green. Likewise (D) is a FFOCT image of a mouse cancerous intestine, (E) is the same field in D-FFOCT while (F) is the combination of (D) and (E) respectively in gray and green. The (G) to (H) images are zoom of the corresponding color box. (M) is a D-FFOCT image of rat spleen to compare to cells we see in cancer samples, these are believed to be immune cells. In (J), (I) and (K), we can see columnar epithelium down and enterocytes in all the upper part that are smaller and barely visible. (L) shows both cancerous cells on the left hand side and cells that are also visible in (J) and (M).